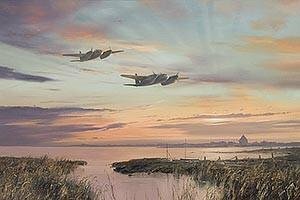 Overall size 16½" x 13"
Image size 15" x 10"
Thunder at Dawn", depicts a pair of de-Havilland Mosquito Mk IVs flying low over the coast of Norfolk where they were based during the Second World War. (Who knows how many other aircraft should be with them, but will never return.) The colours in this sort of image have to be spot on or the finished result can be quite bizarre. Various shades of yellow blending in with various shades of blue as one works the sky down from top to bottom, can result in an uncomfortable greeny colour (as yellow + blue = green). I use Cerulean Blue mixed with White and a very small amount of Burnt Sienna for the pale low down blue, blending in gently with Naples Yellow, Alizarin Crimson and White for the salmony horizon colour. The grasses where applied with a palette knife and really laid on thickly. This is always fun as the result appears very quickly and helps to add to the depth in a painting as foreground features are always darker, more contrasty and applied onto the canvas a lot more aggressively.